A summer of trees. Metal trees, upside down trees and trees on fire. Art and performance with prehistoric allusions deliberate and incidental. Culture and nature entangled. And worlds inverted. In two parts. We are visiting the Belvedere Fort, overlooking the Boboli Gardens, in Florence. We encounter an unexpected outdoor art gallery, composed of trees. But upon closer inspection, not wooden trees. Bronze trees which ring when kicked. 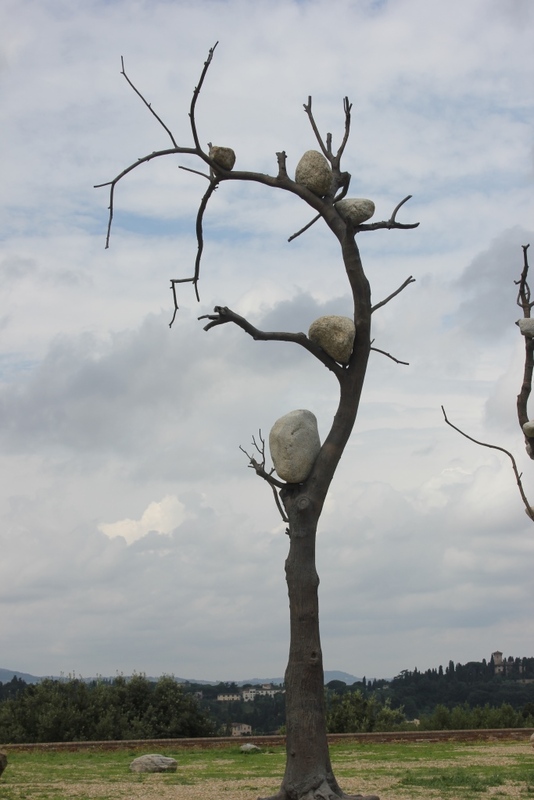 Trees with rocks in them, like grey eyeless owls. 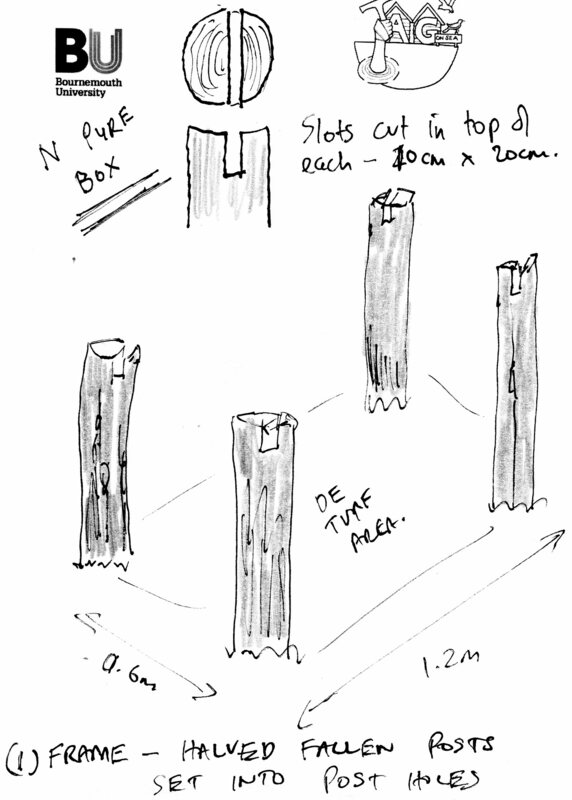 A dissected tree, cut into segments, supported on branch legs, a golden tube along which it is possible to peer from one end to the other, framing faces and cityscapes. 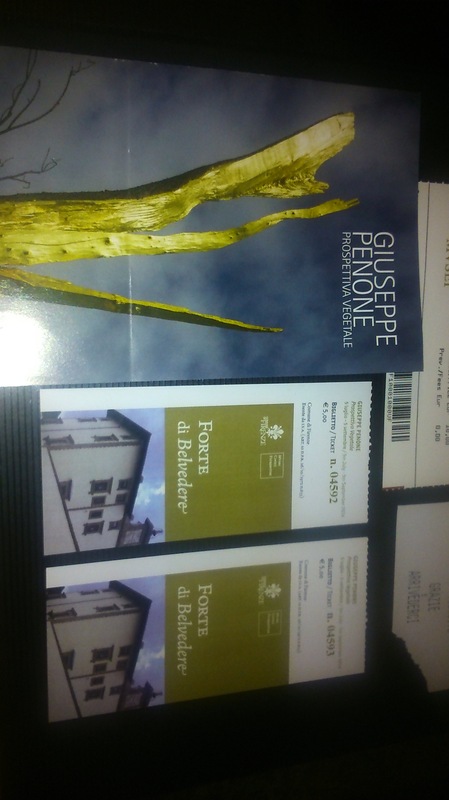 The installations are part of Italian artist Guiseppe Penone’s Prospettiva vegetale (Perspective plant) which ran through summer 2014. The metal trees are manifestations of a ‘deep relationship between man and nature, body and vegetation’ and they represent ambiguity and overlaps between nature and culture, concerns of the artist throughout his career. 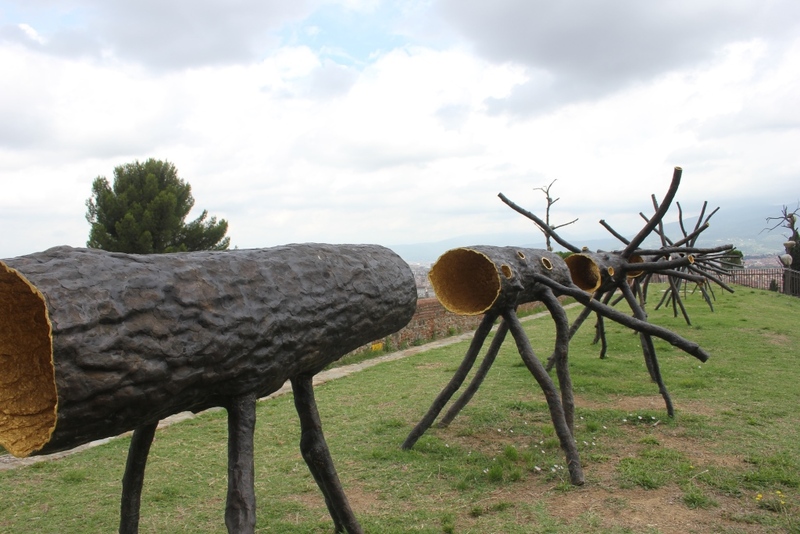 One particular sculpture had a special impact on me – Le Foglie delle radici / The leaves of the root (2011). 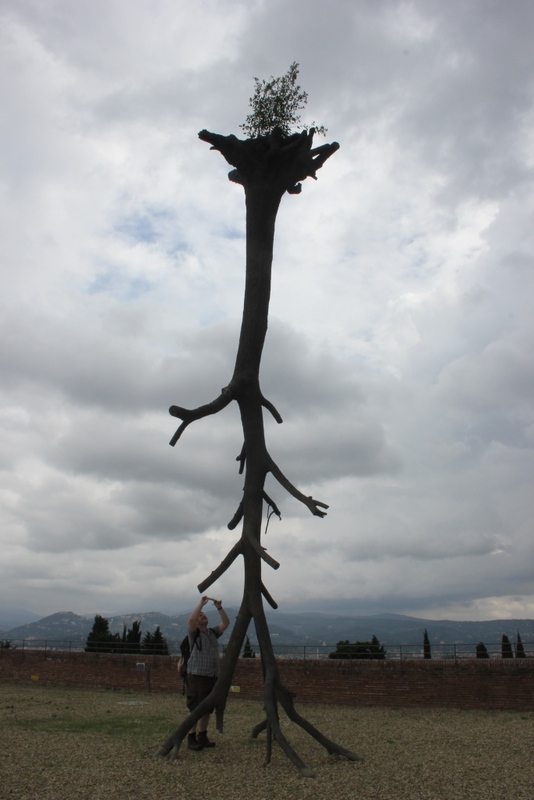 This remarkable piece consists of an inverted bronze tree, with roots towards the sky. Nestling in the root pad was some earth and growing from that earth a small shrub, fed by an irrigation system which runs up inside the trees like an invisible vein. This piece is remarkable, and what is perhaps most special is the plant springing from the top which seems somehow impossible. Yet it reflects the enduring nature of plants; even when trees have toppled, new life can spring from them as anyone who has inspected a root pad can attest to. And of course there are unmistakable echoes of ‘Seahenge’, the timber circle surrounding an inverted tree trunk that was found on a beach in Norfolk in 1998. This incredible monument, dating to the late Neolithic, only survived because of the waterlogged conditions within which it was submerged for thousands of years. 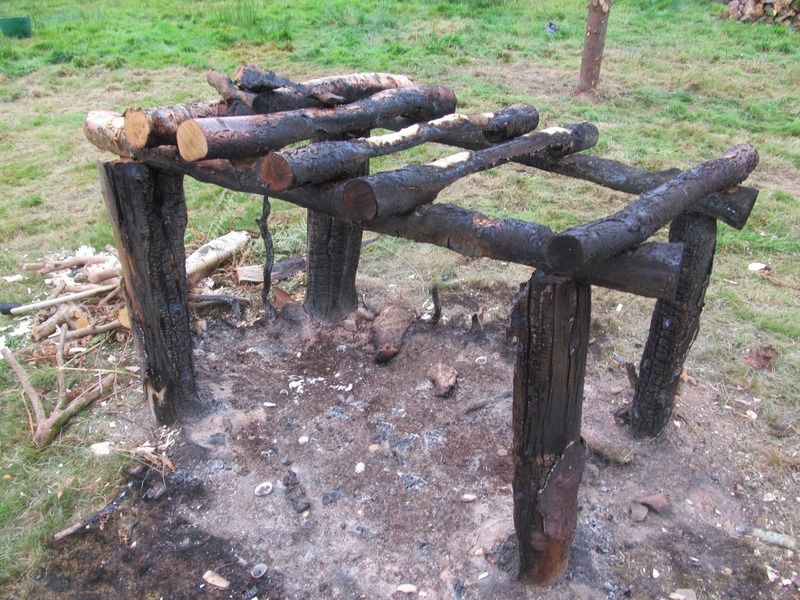 Neolithic timbers almost never survive, and so it is likely inverted trees were a feature of other timber monuments from this period but have not survived. 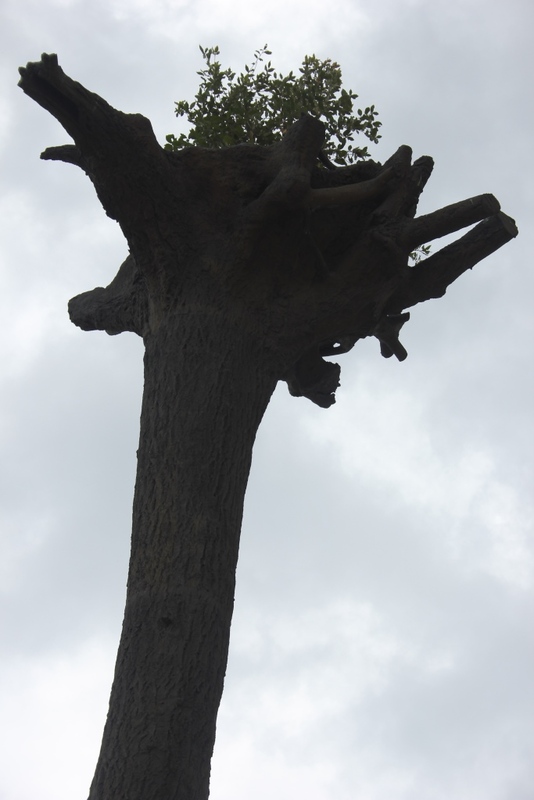 In an intriguing inversion of the living shrub topping Penone’s upside down tree, it is possible the roots of the Seahenge tree originally supported a corpse. The location of this monument, on the edge of the land, has a liminal and transformational quality that can also be ascribed to Penone’s Le Foglie delle radici. There is something magical and compelling about the upside-down tree and the inversion of the shrub growing up from the roots. This is the world inverted, nature and culture reversed. The earth touches the sky, and the land touches the sea. Perspective plants. Another inversion of trees, on the edge of the land and the sea, this time on the island of Arran. This time, the trees are stripped bare of their foliage appendages, defenestrated sitka spruce trunks transformed into the basic building blocks of a timber circle. 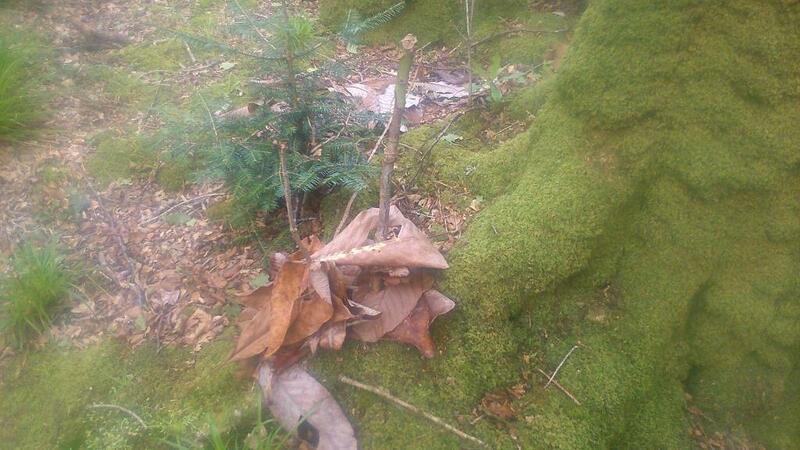 Twisting, invasive, vibrant rhododendron branches and trunks chopped up into kindling, at our disposal to fuel fires. 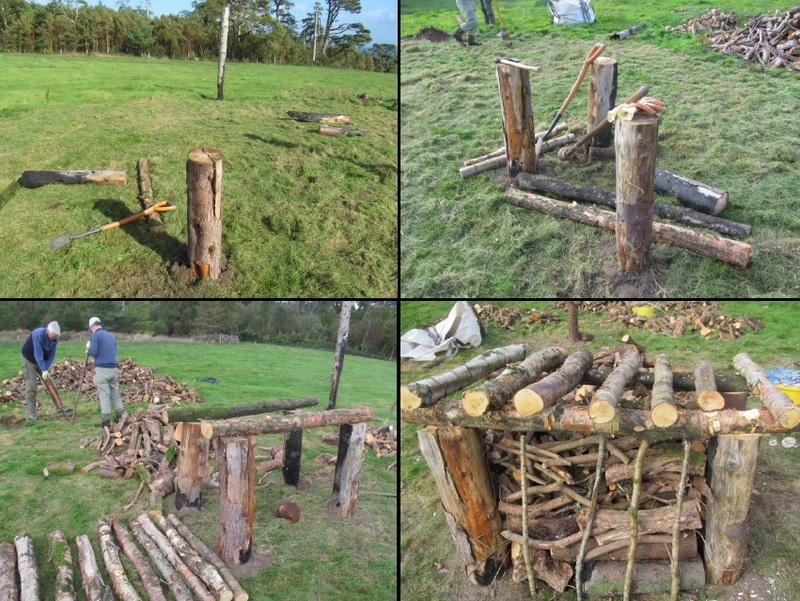 We returned to the scene of the timber circle we built in 2013, on a plateau in a field with views overlooking Brodick Castle, the Firth of Clyde and the Cal Mac ferry trundling back and forth. Last year, we tried to burn the circle and for the most part failed. 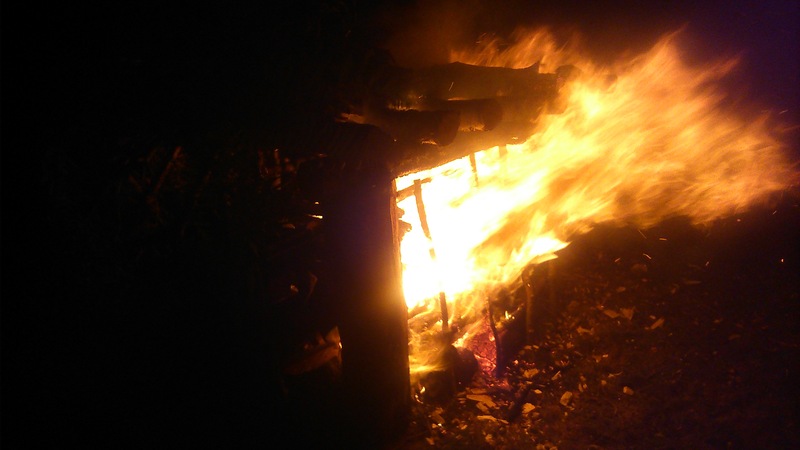 But this time around we stacked timber into piles, preparing pyres to be burnt, and this time all that would be left would be ashes and dark stains on the earth. By burning the circle we took trees and transformed them into fuel and then fire, via a series of experimental activities. Plans were hatched and a spectacle staged. Spectators had a deeply visceral experience that impacted on all of the senses (we hope). I did my best to lose myself in the shaman, the ritual ringleader transported to the top of Goat Fell, deeply serious but chaotic, improvising wildly. Culture was imposed on nature, and nature imposed on culture. Again. As with Penone’s art, and Seahenge, what we did was on the fuzzy zone between nature and culture, and we constructed various reconfigurations of the natural world for our own purposes, bending it to our will, exploiting natural properties, to convey our own messages. But how much were we really in control of what was happening? In the grounds of Brodick Castle, current artist-in-residence Karen Rann has been shaping nature too, manipulating the leaves of the ubiquitous rhododendron into different shapes and arrangements. 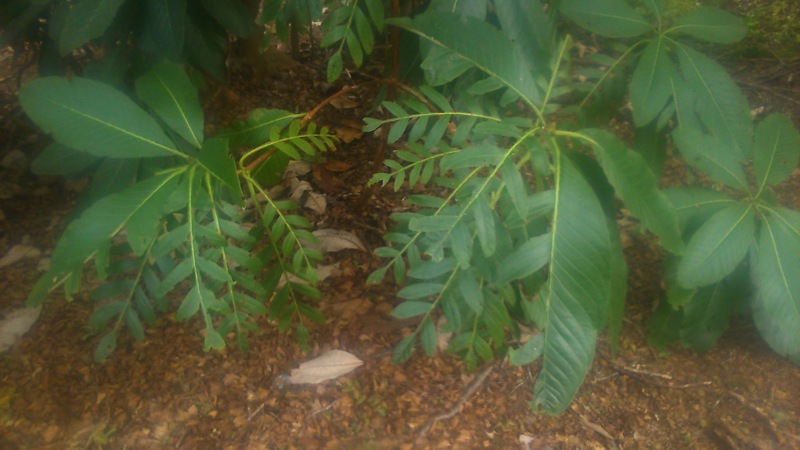 The inspiration is a species of tree native to Arran, Sorbus Arranensis, which has a distinctive pattern of leaf growth. Her project, Nature of Change, has involved trimming big leaves into smaller leaves, stacking and re-arranging leaves, and creating holes in leaves which visitors are encouraged to take photos through and upload online. And an early engagement with the trees in this beautiful forest park was the adoption of her own tree, Rhododendron k arranensis. The artist becomes the tree, nature and culture all over again. And in this case, no fires were necessary to make an impact. This post was inspired by a few experiences I have had this summer that involve trees and the many forms that they can take. This is important to me as an archaeologist, because I study how prehistoric people engaged with trees – whether through clearing them to create space to farm, or re-shaping trunks and branches to build monuments and houses. And the experiences I have today, in the here and now, inevitably impact on how I interpret what I find in the archaeological record. How could this not happen? As archaeologists, we make sense of the ancient past not just with our brains but with our bodies and senses. The past exists for us in the present, and therefore our experiences today, the physicality of now, is the filter through which the past manifests itself today. We can’t do anything to change this, nor would I want to. Sources and acknowledgements: firstly, the Belvedere Fort. I visited with Jan and we had a great time exploring and thinking about this unexpected installation. The information on the exhibition came from a leaflet we picked up on site, and noticeboards. 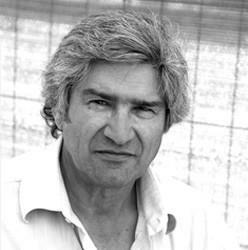 The photo of Penone is available widely online, and more info can be found at the Gagosian website. 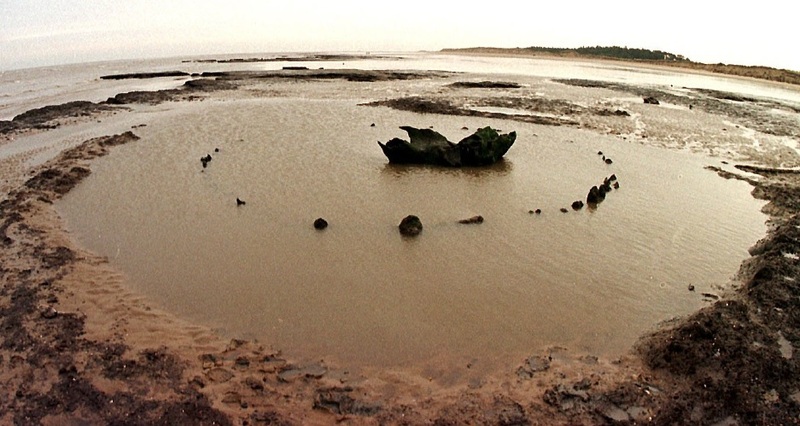 The Seahenge image was sourced from an excellent online guide to the monument, produced by Norfolk Museums. Burning the circle as an event involved a large team of helpers and funders. I would especially like to thank my colleague Gavin MacGregor, whose idea inspired the pyres. The National Trust for Scotland Rangers at Brodick made it all possible, and special thanks to the amazing Corinna Goeckeritz. 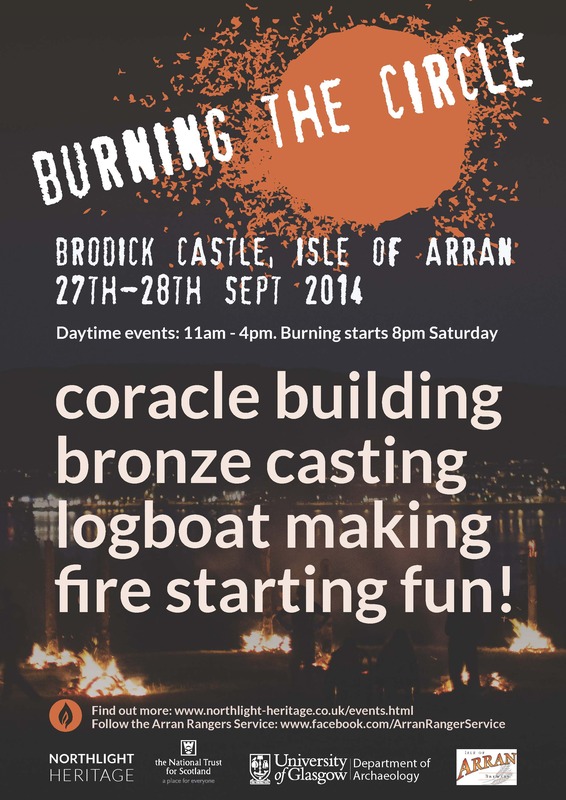 The poster was designed by Ingrid Shearer of Northlight Heritage, who also were fundamental to this event happening. I took the photos of the Karen Rann artworks, and for better images, see her blog and webpage (links above). Refreshing revivals remembering rituals evoking residual micro memories of possible past times. Larger scale events are happening at 2 festivals in Edinburgh at Beltaine and Samhain.